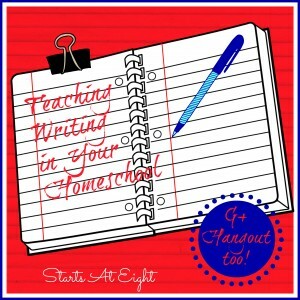 Through the years I have struggled with how best to handle assigning and grading my children’s writing. 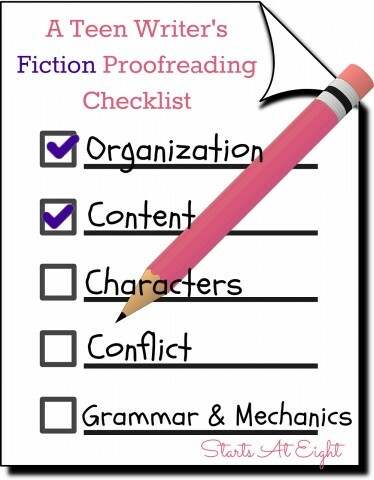 I created this Non-Fiction Proofreading Checklist to help not only myself, but also to help my teenager look more critically over her own writing. 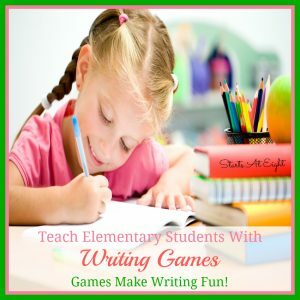 Judging the written word can be daunting and scary. Are we being to hard? Too easy? Is it a creative difference or a concrete grammar issue? These questions can be answered in so many ways and each person might answer them differently. It is important not to pick too much as you might squelch your child’s creativity in the process. 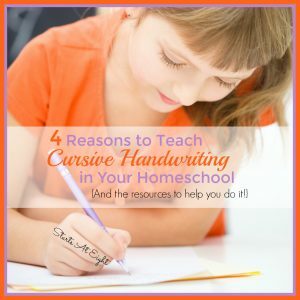 I have a few things for you to consider when looking over your child’s written work. First and foremost, papers should cover the topic of the assignment without going off on a tangent, or seeming to lack in information and content. With this in mind there should be a clear flow from sentence to sentence and paragraph to paragraph. Be sure that each paragraph covers one thought and then leads nicely into the next paragraph and that new thought. Next, be sure to check that all papers have both an introduction and a conclusion. Both the introduction and the conclusion should be on topic and keep the reader’s interest. The introduction should let us know what the main focus or topic of the paper is and the conclusion should wrap up your theme in a new and interesting way. Finally, the paper should have solid grammar and mechanics. Things like spelling, capitalization and punctuation are all important things to look for. If you or your student are unsure of a rule, hop on the Internet and look it up! I can’t tell you how many times we have opened up a grammar book that we keep on hand for reference to double check the mechanics of a sentence! Using a checklist can help both you and your child stay on track. I have found that having my teen write a paper and then walk away from it for a few days can help to give her perspective. After she has put it aside for a few days I have her take the checklist and go over her paper. It is easier for her to find and correct mistakes than it is for you to have to do it. In this manner there is less chance of squelching their creativity because it is on them to make adjustments and corrections. After my teen has gone through her own paper with fresh eyes and has made corrections, then I will look over it and go through the checklist myself. Normally by the time it is my turn to look it over any major structure and grammatical errors are corrected. This then leaves us to talk about how we might add or subtract things, or tweak sentences that seem to read awkwardly. 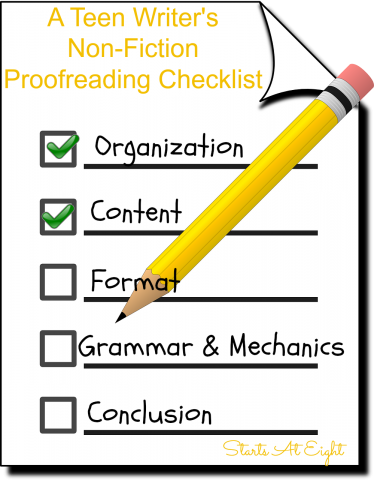 You can download a printable pdf version of my Non-Fiction Proofreading Checklist from Starts At Eight and use it for yourself and/or with your child.